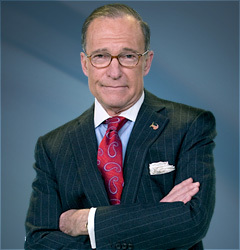 In his fourth year on the StoneZone best dressed list, Kudlow, the supply-side apostle and pro-growth advocate who chews up the business news and lays down the Reaganite creed at CNBC has an uncanny sense of the "right" shirt and tie combinations for TV. The good taste of Turnbull & Asser, where Sean Connery got his shirts to be 007 is Kudlow's haberdasher of choice. Master Tailor Leonard Logsdail make his suits, somber, impeccable and quiet -- a canvas for his bold shirt and neckwear combinations.